Product prices and availability are accurate as of 2019-04-20 00:55:55 UTC and are subject to change. Any price and availability information displayed on http://www.amazon.com/ at the time of purchase will apply to the purchase of this product. Give your Mom a gift that shows how much you appreciate her. 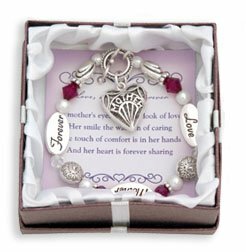 This 8" long bracelet is a perfect way to express your love for Mom. Comes complete with a special gift box. 8" Long Comes complete with special gift box Reads "Mother - Forever - Love" Great gift for your special Mom!